Hayao Miyazaki was born January 5, 1941 and after an economically quiet childhood and adolescence, but marked by his mother's long illness (nine years with a form of tuberculosis), in 1963 he graduated in Economics and Political Sciences. The years spent in hospital, next to the maternal figure, in many respects, are celebrated in My Neighbor Totoro as many are underlining the autobiographical aspect of this anime. After watching anime "Hakuja Den", (directed by Taiji for Toei Douga in 1958), he decided to become a comics artist but soon discovered he did not know how to draw!! In the same days of the university Hayao find work at Toei Douga (Toei Animation) assigned first to Watchdog Bow Wow and then switched to the TV series Wolf Boy Ken: began to carry out union activities within the company and sentimentally approached Akemi Ota, a fellow animator. After the war the birth of the unions was allowed and many of them were directed by young communists or communist sympathizers and Miyazaki, together with Isao Takahata (his mentor), was one of them. 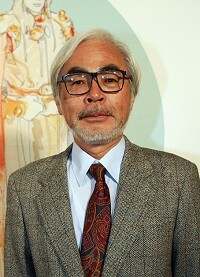 The early works in which Miyazaki was engaged, such as Horus or Conan, show somehow his political faith; he once said that he was not even convinced that he made Nausicaä a princess because he "made her one of an elite". Pom Poko at the bottom is nothing but the story of how the liberal movements in post-war Japan failed, according to Miyazaki's point of view. In January 1967 his first child was born and in 1969 he released The Flying Ghost Ship. In 1969 the second child was born. In 1971, Hayao left Toei Douga to join Takahata and Otabe at A-Pro. He took a trip to Sweden to secure the rights to Pippi Longstocking, but the attempt was unsuccessful. In 1973, the Miyazaki/Takahata/Otabe group left the A-Pro to go to Zuiyo Pictures. In July, he traveled to Switzerland to take inspiration from the drawings of Heidi: Girl of the Alps. In 1975, Hayao was again traveling abroad, this time in Italy and Argentina, to prepare for Three Thousand Miles in the Serch of Mother (Marco) (scripted from Dagli Appennini alle Ande, by De Amicis). In 1980 he directed episodes 145 and 155 of the television series Lupin The 3rd under the pseudonym of Telecom. In 1983 work began on the Nausicaa of the Valley of the Wind. 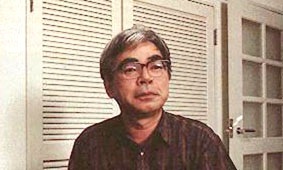 Takahata became the film's producer and Topcraft was chosen as production studio. The younger brother of Hayao, Shirou, worked at Hakuhoudo (Japan's second-largest advertising agency), so it's no surprise that Tokuma and the Hakuhoudo unite for the realization of Nausicaä. His mother died at the age of 71 in July. 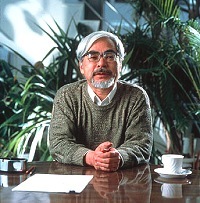 In 1985 the Studio Ghibli was founded to produce Laputa: Castle in the Sky and in May Hayao is in Wales to prepare the settings of the new anime. In the late 1980s and early 1990s, Miyazaki came to the conclusion that Marxism and historical materialism were wrong. It was a rollover that is clearly visible in the Nausicaa manga. His films are always optimistic because he prefers that they say "I would like these people, these things, this world ..." rather than saying "things are like that". His films are for children and young people and he believes it is important that they observe the world in a positive way and that they have hope. His manga, on the other hand, explore the dark side of human nature made of violence, hatred, anger, narrowness, stupidity, war... but even so it remains optimistic as it shows unshakable faith in the human spirit and desire to live. After Mononoke Hime he dedicated himself to the creation of short films to be shown in the "Ghibli Museum" which will be inaugurated in 2001. The films will be based on books for children. 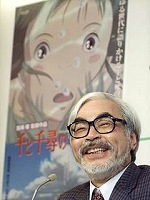 On December 13, 1999, the Studio Ghibli, in a conference, announces the next film by Miyazaki whose title is Sen a Chihiro no Kamikakushi (Spirited Away). The announcement came after everyone was convinced that Miyazaki had retired because after Mononoke Hime he said that this was the last film he would do that way. He only meant that he would not overshadow all the stages of film processing, intervening directly in the reworking of individual drawings and frames (which had happened for all his films). The rest is a recent story: "Spirited away" was released in 2001, which won numerous awards such as Golden Bear at the Berlin Festival and Oscar for best animation film. "Its long and prosperous life has had its ups and downs, but the new century has reaffirmed to the whole world, if it were still needed, its place among the greatest in world filmography. A beacon, an example to follow, a master and much more; there are no epithets that can summarize how much Hayao has given to the imagination of young and old, passionate or not animated cinema."